I agree with those who say we shouldn't pay too much heed to the so-called Panama Papers. Like Wikileaks, the problem with the Panama Papers is that we don't always know fact from fake. If tomorrow they say Lim Guan Eng is in the Panama Papers, some people may be stupid enough to believe it because, out of anger or jealousy or some other reasons, they just want to believe it! Malaysia Today has the Asia Sentinel's story h e r e.
Just the way I see things. And these things are there, just that some people refuse to see them. That's how they see things. At least 1,784 Malaysian individuals or master clients – including the Sultan of Johor and the sons of three prime ministers – and another 517 offshore entities are among the 215,000 names found in the Panama Papers, the 11.5 million documents taken from the Panamanian law firm of Mossack Fonseca & Co. Some of the most notable names among the individuals and entities are Kamaluddin Abdullah, head of Feldspar Holdings and son of former Prime Minister Abdullah Ahmad Badawi; Mirzan Mahathir, son of Mahathir Mohamad; and Mohamad Nazifuddin Mohamad Najib, son of the current prime minister, Najib Razak. Mahathir’s brother-in-law, Mohammed Hashim Mohammed Ali, the onetime head of Malaysia’s military. 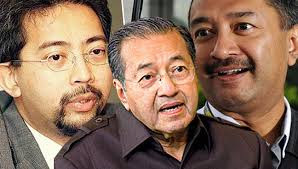 Others include Sultan Ibrahim Ismail of Johor; Abdul Aziz bin Tawfiq Ayman, husband of Bank Negara Governor Zeti Akhatar Aziz; Muhammad Muhammad Taib, former Rural and Regional Development Minister and UMNO information chief, who since has joined the opposition Parti Keadilan Rakyat; and Lim Kok Thay, the current managing director of Genting Group; Abdul Halim Harun, former chief executive of UMW Holdings, one of Malaysia’s biggest conglomerates; Sharifuddin Hizan Zainal Abidin, former Group Managing Director of Felda Holdings Bhd; and Khoo Kay Peng, one of Malaysia’s richest tycoons and head of MUI Group. The list also includes the late Hussain Najadi, the founder of what was first known as Arab Malaysian Bank, later Ambank, who was murdered under mysterious circumstances in 2013 after complaining, his son has charged, about corruption in the United Malays National Organisation. Police said he had been killed in a land dispute. The late Tan Tiong Hock, the former Malaysian Chinese Association secretary general, who died in 1985, is also on the list,which can be found here.